I bought Tolgay as my first card. 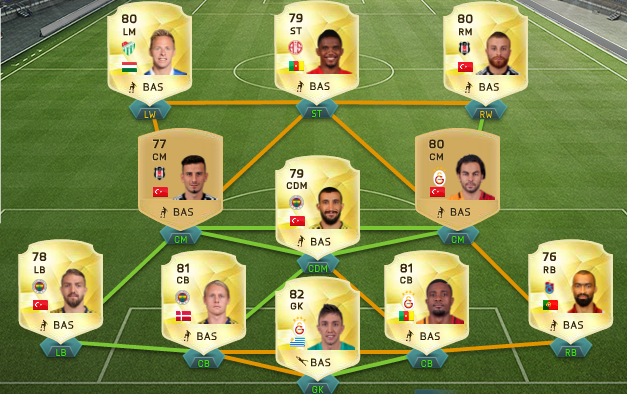 Have around 3k which should be enough for a semi decent Süper Lig team. for sure, most non rare's can be bought for 350 coins anyways. a lot of rare golds too like frei, topal, dszusdszak etc. Caner and Gokhan Tore only players I spent more than 1000 coins thus far. 1 penalty and a deflected shot but still happy for him. we started quite superb for just 3 minutes. perfect line up too, finally NANI - RVP - Volkan Sen 433 up front. 1-1 already mate, it was a bs penalty call for Molde anyways..
so your anti RVP and NAni bias is bringing you here to post HAHAHAHA when we go 0-1 down? we are looking a looott better than the weekend's stink performance, especially in the way we are spacing on the pitch and very active on the wings. in a month or so this team might take off proper. Imagine spending that amount of money compared to Molde and being wrecked by Tommy Høiland ffs, the man spends more time in a tanning bed than on a football pitch. dafuqs wrong with Fener man? Fans almost rioting because of a failed goal kick hahahaha, embarrassing lot these Fener fans. well tbh Vitor is starting **** people off with his idealistic talks but not backed by performances on the pitch. why is Volkan not playing ffs? good job subbing off Mehmet Topal instead of Raul fckn Meireles! ugh wtf we can't even hold the ball now. I'm not gonna say much more the coeff ranking talk for themselves . Turkish sides in Europe are on their arse. Last thing of note was Galatasaray qualifying from a group of death with Madrid and Juventus back when Mancini was in charge.